It's not only Germany receiving the latest updates for the Samsung Galaxy Note 10.1 stylus-laden tablet, the US is now queued up, too. 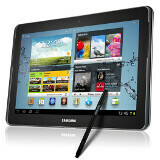 The American versions of Samsung's S Pen tablet is now being graced with Android 4.1.2 Jelly Bean as an OTA update. This one also fixes the Exynos processor vulnerability, so you can stay warm and fuzzy about the whole thing when it hits your tablet. The 487 MB update is for the Wi-Fi versions only for now, and owners report success with both OTA download, as well as Samsung Kies syncing software installation.